We were strolling down Whyte Ave when we happened to pass by the Blues on Whyte festival, and noticed a long line forming. It turned out to be a free pancake breakfast and as a native Calgarian, I just had to jump in line as Stampede breakfasts have always been one of my favorite things about July. 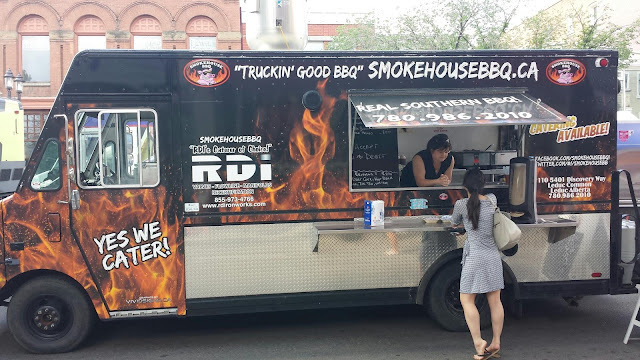 Though the breakfast was delicious, it wasn't exactly filling and as we wandered around the streets closed off for the venue we spotted a few of Edmonton's newer food trucks, namely NaanOLicious, The Act Out and About, and Smokehouse BBQ Food Truck. Since we were familiar with the restaurants associated with the first two, we decided to give Smokehouse BBQ a try. Their menu of the day consisted of: Burnt Ends (brisket) sandwich, Pulled Pork Sandwich, Chili Cheese Fries, Pork Ribs, and a few other items. As it was still fairly early in the morning (don't judge, who says you can't have a good brisket for breakfast?) there was no line. I was stuck deciding between the Burnt Ends and Pulled Pork Sandwiches, and the lady running the truck must have seen the pure indecision on my face because she readily offered to make me a half-and-half sandwich. The first thing I noticed about the sandwich was that the bread wasn't toasted or warmed, nor was it anything special. I found the meat itself rather dry, particularly the large chunks of brisket. 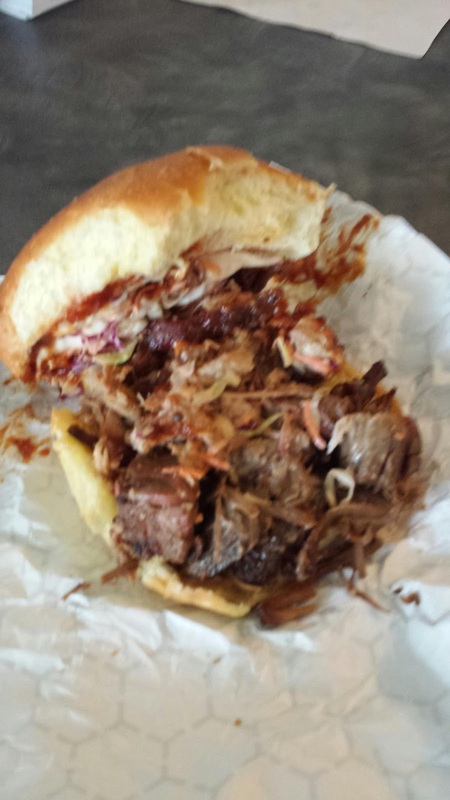 However, I am partial to pulled pork that is slathered in sauce so it may be a matter of personal taste. Atop the pile of brisket and pulled pork sat some coleslaw and BBQ sauce. I found the BBQ sauce particularly tasty, smoky and flavorful and I wish more of that flavor had been incorporated into the meat itself. Overall, the sandwich was nothing out of the ordinary and although $7 was a reasonable price, I would probably pass next time. Corporate Catering This is usually very informative wrote content IN ADDITION TO nicely for getting a good transform. This has good get out which a lot of an individual still realize The best way to Make a quality submit!